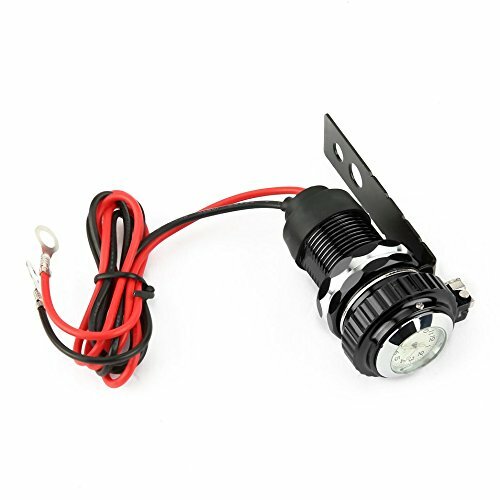 Suitable for motorcycle, car, ATV and other vehicle of 12-24V. Waterproof and dustproof cap design provides long service life. With luminous watch, you may check the time any time and any where. Smart IC design, automatic charge speed adjustment according to electric quantity and type of battery. With overvoltage and overcurrent overcharge protection. Automatic opposite connection protection effectively keep your device safe. Premium Aluminium Alloy materiel, wear resistant and durable. Easy installation, red wire connects to positive pole of battery while black wire connects to negetive pole. Perfect USB charger for refitting your car, motorcycle, etc.